Well, luckily there are a few accessories that can help make your life easier: an L-bracket, a tripod collar, and a bubble level. 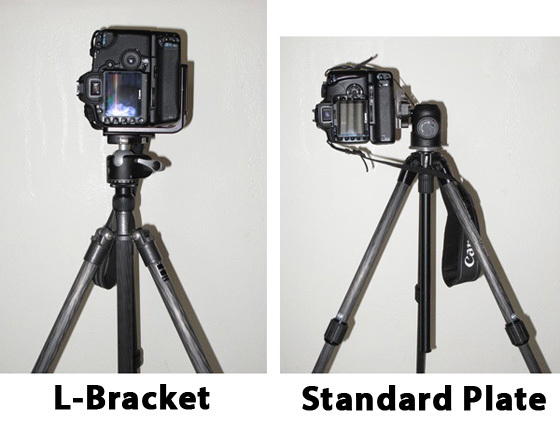 The “L” bracket is a special kind of plate for your tripod head. It’s shaped like an “L” and allows you to put your camera in a vertical position, while still keeping it in the center of the three tripod legs (see photo above). With a standard plate, you have to tilt your camera to the side of the tripod if you want to shoot vertically. It’s important to keep your camera in the center of those legs because that’s where the tripod can best support your camera. And, better support means sharper photos. The L-bracket also gives you a few more inches of height when you’re shooting vertically. And, as I’m sure you know, a few inches can definitely matter in a composition. L-brackets are only helpful for shorter lenses though (less than 200mm), because longer lenses typically shift the camera’s center of gravity, so they require a special tripod collar to support them properly (see item #2 below). 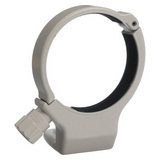 Not all tripod heads support L-Brackets, so check the website of your head’s manufacturer. And, the L-brackets are specific to each camera, so make sure you get one that fits! If you’re looking for a new tripod head that supports L-brackets, then I can highly recommend the heads from Really Right Stuff. Have you ever tried mounting your camera on your tripod with a big telephoto lens on it, and then noticed the camera shift down a few inches after locking in the ballhead? It’s a common problem when using long telephoto lenses (200mm or longer), and it happens because with longer (and heavier) lenses attached to your camera, you’re shifting the camera’s center of gravity. The best way to prevent this is to use a tripod collar made specifically for your lens. Sometimes these tripod collars come with a telephoto lens, but if you didn’t get one, check the manufacturer’s website (or check some out at B&H). And, make sure you get one that’s made specifically for your lens, because different lenses weigh differently and so they affect the center of gravity differently too. Your tripod will provide the strongest support when the weight of your camera is evenly distributed between all three legs. And, a bubble level will help you determine when your tripod is balanced like this. On some tripods, these bubble levels are built-in, so look around for them first. But, if your tripod is missing one, then the manufacturer likely has one available as an accessory. My Gitzo tripod didn’t come with one built-in, but I got one for about $15 at B&H. Getting your tripod completely level can definitely take awhile, so using a bubble-level is really only practical when you have time and when you need a really long exposure (like for night time photos). Also, keep in mind that a tripod level is different from using a hot-shoe level. A level on your tripod will tell you if your tripod is level (and evenly distributing the weight between the legs). And, a hot-shoe level will tell you if your camera is level on top of the head. Both are important, but they both measure the levelness of different things. Good tips. I’m surprised with the cost of a Gitzo that they can’t put a bubble level on their tripods. One other item for a tripod that comes in handy is a hook in order to hang some extra weight to ensure your tripod doesn’t get tipped over in strong wind. Just my 2cents worth. #4 Short center post. Don’t know if you can remove a portion of your Gitzo or not but on my Induro tripod I ordered a separate short center column so that I can get way down low with it. In fact once I put the short column in I’ve kept it in.